Questionnaire: The Perfect Tropical Fish for You? Home > Aquarium > Questionnaire: The Perfect Tropical Fish for You? If you're thinking about stocking a new tropical fish tank, the question of which fish to choose is always a tricky one. 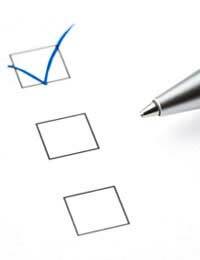 Make it easy on yourself by working through this simple questionnaire. If yes, it's easiest to start with a freshwater tank and hardy, easy-to-keep fish like danios, barbs, rainbow fish or tetra. If no, go on to question 2. 2. Do you want a freshwater tank or a marine tank? If you want a freshwater tank, go to question 3. If you want a marine tank, go to question 4. 3. Do you want a solitary fish, a shoal of fish of the same species, or a community tank? If you want just one fish, go to question 5. If you want a shoal, go to question 6. If you want a community tank, go to question 7. 4. Ask yourself the same question as in 3, above, but if you want a single fish go to question 8, for a shoal go to 9, and for a community go to 10. 5. Just want a single fish? One of the easiest fish to keep in isolation is the male betta, or Siamese fighting fish. They're beautifully coloured and, though happy living alone, they often form a bond with their owners. If you want something bigger and you're prepared to take certain safety precautions, piranhas make hardy and interesting pets. If you're looking for more of a challenge, consider a puffer fish – vulnerable to stress but long-lived in the right environment, friendly and intelligent, these are the sort of fish people really fall in love with. 6. Do you want a shoal of fish? If you have plenty of space in your aquarium, discus make wonderfully satisfying pets, beautifully coloured, unusually shaped and always attentive to what's going on around them – including outside the tank. If you have a really big tank, arowanas can be lots of fun, but they do grow up to three feet long! For a group of small fish who are happy on their own, try gourami or tetra. 7. Is a community tank for you? There are many great community fish to choose from for the freshwater tropical aquarium. Few fish are as adaptable and friendly as killifish, though you will have to be careful to avoid keeping them with tankmates who like to nip fins. Rasboras are friendly and good natured with all sorts of other fish, and are often happier in a community tank than in one of their own. And although some aquarists get nervous about loaches chasing their other fish, that's usually just their way of being friendly – these intelligent, playful fish are a great community choice. 8. A fish to keep on it own? Many popular marine fish are happiest when kept on their own. If you're prepared to live dangerously, lionfish or scorpion fish make beautiful exotic pets, but make sure you have your emergency procedures all planned out in case they poison you. For those who'd rather not take the chance, a solitary angelfish can make a delightful pet and can live happily that way for years. If you've got room in your aquarium to give them the personal space they need to feel happy, damselfish can be an excellent choice to keep in a shoal on its own. They're beautifully coloured and, though they can be shy at first, time will make them bolder. If you're an experienced aquarist and you'd like to try something truly exotic, seahorses are fascinating pets, unlike anything else you'll ever keep. 10. Community tank for children? If it's your children who first took an interest in getting an aquarium, why not reward them by getting the community fish they've probably been wanting all along? Clownfish are friendly, sociable, and can get along with virtually any other similarly sized fish, though they will refuse to share their anemone habitat. Butterfly fish get on better in a community tank than on their own, and a solitary knifefish makes a great addition to any marine aquarium. @May, as you're a beginner you would be best suited to a freshwater tank and to start with we suggest getting some Danios here's a link to one of our articles about keeping Danios. I am buying my first tropical fish and tank soon can you advise me what size tank and what fish is best for a beginner, I would like a shoal of fish. and easy to look after.